Team Parker Racing’s Rick Parfitt Jr. and Seb Morris are the 2017 British GT champions. A duo in the #31 Bentley Continental GT3 ended fourth in the final race of the season at Donington Park. Last year’s champions Derek Johnston and Jonny Adam won today’s race in the #1 TF Sport Aston Martin Vantage GT3. 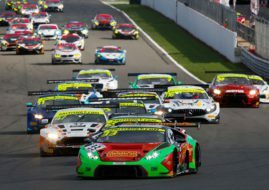 Their teammates Mark Farmer and Jon Barnes finished second in the #11 car, ahead of Barwell Motorsport’s Jon Minshaw and Phil Keen in the #33 Lamborghini Huracan GT3. The similar situation we have in the GT4 class, where defending champions Graham Johnson/Mike Robinson won the race in the #501 Optimum Motorsport McLaren 570S GT4 but the title go to Will Tregurtha and Stuart Middleton in the #55 HHC Motorsport Ginetta G55 GT4.